SUMMARY: World fisheries yield 90 million metric tons of fish per year (over 70% of the world’s commercial fish production) and play key roles in global food and income. Marine fisheries have long been driven by single-species management strategies in attempts to maximize yields without compromising future catches. However, single-species approaches overlook ecological linkages and interactions, and the ability of marine environments to sustain multi-species fisheries. Hence, some populations have been fished to collapse and others have become economically inefficient, often with consequences for non-target populations. Our science and management must operate in harmony with established ecological principles, if we are to conserve fisheries and avoid the declines of the past. Fishery professionals must also harmonize approaches for solving ecosystem-level problems. Most importantly, we must be willing to consider new approaches that (1) improve our capabilities and skills in multidisciplinary fisheries science, and (2) embrace new conservation paradigms that involve fishers and avoid managing species as if they existed in a vacuum. The recently revived World Council of Fisheries Societies can be a key global voice for helping implement such visions, and for uniting our professionals, fishers, and policymakers in ways that promote healthy world fisheries in the 21st century. World fisheries and aquaculture have witnessed dramatic expansions over several decades. They support many global needs: food for consumers, protein for animal feeds, employment and income for fishery workers, and recreational needs of sport fishers. Fisheries world trade now exceeds US$50 billion, with more than 36 million people employed in primary capture fisheries and aquaculture production,” and perhaps 200 million people when both direct and indirect employment is considered.) Expansions in landings and production are directly linked to a growing human population that requires more food, and to technological improvements that aid the capture, processing, and marketing of fishery products. However, an associated increase in fishing pressure during the previous century, allocation conflicts among users, and management without regard to ecosystem effects have led to economic collapses of certain fisheries that once flourished for many centuries.” My premise in this paper is that fishery managers and scientists must take a much broader view than that practiced in the past. We must embrace new paradigms and consider ecosystem-wide consequences that avoid managing species “in a vacuum.” We must also involve resource users in the decision-making process. My threefold purpose is to provide a global perspective on (1) world fisheries production trends, (2) the current thinking in the fisheries profession on ways to achieve resource conservation with ecosystem-level approaches, and (3) a perspective on the future outlook of our resources and profession. Fig. 1. World capture fisheries and aquaculture production through 1998 (from FAO1). Production in both marine and inland capture fisheries has stabilized over the last decade (Table 1), suggesting attainment of maximum potentials. '”4) Most stocks are now fully exploited with a greater shift towards aquaculture to meet human consumption needs (per capita fish supply about 15 kg per person; Table 1). China, Japan, and the U.S. lead the world in capture fisheries production. When combined with Russia, Peru, Indonesia, Chile, and India, these nations account for more than 50% of the total production (by weight) in the world.’) The largest landings occur in major portions of the Pacific and Atlantic oceans. The top species captured (1996 and 19981) include pollock, herring, anchovies, mackerel, and tunas. The preeminent scientist Thomas Huxley once proclaimed “probably all the great sea fisheries are inexhaustible: that is to say, nothing we do seriously affects the number of fish.” 5) A lot has changed since . Huxley’s time! But the pattern of fisheries exploitation has not. In a way, we often treated our aquatic resources as if they were agricultural commodities, and assumed that “the field” (the ocean) would always re-seed itself for continued harvest. Of course, we quickly learned that the field cannot replenish itself when harvest intensity is excessive. The behavior of fishers also has followed familiar patterns. Once a new fishery develops, more fishers and boats enter because of huge incentives for early profits. Fishery exploitation then proceeds in distinct phases that involve development, full exploitation, over-exploitation, collapse, and recovery.6)Jennings et al3) thoroughly describe the characteristics of each phase and cite examples of well-known economic collapses. One of the best known is the collapse of Atlantic cod (Gadus morhua). Hutchings and Myers7) review the history of the decline and provide a perspective on the lessons learned. Once a hook-and-line fishery (1800’s), new technology (bottom trawls, gill nets, and factory freeze-trawlers) soon improved fishing efficiency. Catches increased from 100,000 mt in the early 1800’s to 250,000 mt by the early 1900’s, and to over 800,000 mt by 1968. The population became over-exploited, finally collapsed, and was closed in 1992, after the spawning stock had declined from 1.6 million mt (1962) to 22,000 mt. A lack of data, improper data treatment, and overconfidence in methods were among the factors cited in the collapse. Major marine fisheries: As of 1994, about 35% of 200 major marine fisheries showed declining yields, 25% had reached a plateau (at high exploitation levels), 40% were still developing, and none remained at low (undeveloped) exploitation levels.10) Thus, 60% of the world’s major fishery resources were either highly exploited or in decline. A similar study in the early 1990’s concluded that 69% of known stocks needed urgent management, and that a reduction of at least 30% of fishing effort was required to rebuild resources.’) As of 2000, the FAO estimates that 50% of the world’s major marine fisheries are fully exploited, 15% over-exploited (no room for expansion), and 10% fished to depletion or in recovery.’ Thus, 75% of the major marine fisheries are now at full or over-exploitation. Inland fisheries: Inland fisheries account for about 9% of total capture fisheries (Table 1). The top ten producers (six are in Asia) account for 62% of world landings4) Less is known about the status of inland aquatic resources compared with major marine populations. However, it is well known that inland fisheries remain under pressure from both overfishing and habitat loss. Where information is available, about 20% of freshwater species are either threatened, endangered, or extinct.”) Thus, freshwater fisheries critically need protection to conserve important biodiversity. Aquaculture: Most of the world’s culture production has developed in freshwater to meet subsistence food needs. 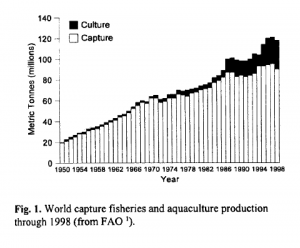 As of 1996, aquaculture provided 20% of global fisheries production, and one-third of the food fish.4) As of 1999, culture provided 26% of global production (Table 1) and plays a major role in feeding the world, as capture fisheries reach full exploitation. The aquatic ecosystem: Although individual stocks and fisheries have been of great concern to managers, there is increasing world attention on aquatic ecosystems and the impact of fishing on structure and function. Whereas broad indicators of change are available for fishery status and trends, comparatively little data exist on the relationship between fishing and the status of global resources from an ecosystem perspective. World aquatic ecosystems are being impacted by the demands of a growing human population. Some of the world’s largest river systems no longer flow to the ocean (or are fragmented by dams and diversions), and per capita water consumption has increased by 50% since 1950.1) Habitat degradation has complicated efforts to properly manage declining resources in the world’s aquatic ecosystems. A somewhat recent concern has been that fishing may cause large, valuable predatory fishes to be replaced by other species at lower trophic levels, causing substantial changes in the structure and function of aquatic ecosystems.12) A new study13) argues that overfishing occurred worldwide in coastal ecosystems over many centuries and fundamentally altered ecosystem structure and function because overfished populations no longer interacted with other species in the community. Such findings underscore the need for an ecosystem approach to fisheries management. Pauly et al.”) describe several new ecosystem models that incorporate trophic interactions in a holistic way, to better understand the ecosystem effects of fishing. Such approaches highlight the need and rationale for looking beyond single-species paradigms that ignore linkages and interactions among species. Rather, these ecosystem-level models embrace established ecological principles, including interannual and decadal shifts in marine productivity, and offer great potential for future management efforts. The fisheries management community has seen numerous calls to reduce discards, by-catch, and waste. In addition, strong concern has been expressed about ecosystem-level impacts of fisheries on marine birds, mammals, and other aquatic species, especially slow-growing and highly vulnerable species of long-lived marine fishes.15,16) It is the premise of this paper that a much broader approach is also needed to address these fishery-related issues. Aquaculture is the fastest growing sector in food-fish production at the present time. It is clearly a promising alternative to once-abundant capture fisheries for feeding the world. However, there are well-known risks. Culture operations must insure that adverse impacts to wild populations are minimized, as are introductions of alien organisms into non-indigenous environments. In some instances, shrimp culture operations have replaced mangrove ecosystems (erosion protective barriers), while increasing the risk for the spread of new pathogens. Marine net pens are also under scrutiny because of impacts to benthic environments and the large number of escapees in waters beyond native ranges. The need for large inputs of natural fish protein (to make fish and animal feeds) creates additional pressures on certain fisheries.”) Despite such challenges, aquaculture offers tremendous opportunities to recycle nutrients and simultaneously meet global food needs. If we work to minimize the risks and proceed with caution, aquaculture provides us with the real potential to reduce exploitation of capture fisheries, as the world looks for options beyond current fisheries production. Given the state of global fisheries and their potential effects on aquatic ecosystems, what does the future hold for our resources, and what is the outlook for the fisheries science professional? In North America, society expects fisheries scientists to restore and recover the plentiful aquatic resources once enjoyed by all. It is a dream to think we can do so, by ourselves. The problems and challenges are huge. We are not magicians, but society sometimes thinks we are! How can our science and its professionals best contribute to future conservation of global aquatic resources? First, there is a growing consensus that sustainability, especially for single-species management paradigms, is an unattainable goal and the wrong objective for managers, without first considering an alternative goal: the rebuilding and restoration of ecosystems towards predepletion states.”) Whatever we as professionals decide to do, we need to embrace new paradigms for management that transition us beyond single-species approaches, and we need to recognize the value in taking much broader views than previously considered. Second, there is an equally strong argument for including the behavior of fishers themselves in fishery management decisions.”) The premise is that, even when the interconnectedness of the exploited stocks is taken into account, the problems that beset fisheries management are likely to remain unless we factor the behavior of fishers into management equations. Third, there is a growing consensus that fishers must have ownership of the resources they harvest. Fisheries that are open to everyone are the responsibility of none. Because resources are becoming ever more scarce, conflicts over allocation are becoming more frequent. A solution may be the development of rights-based management systems1) that involve users in decisions. When local communities become caretakers of resources, conservation goals can be achieved. An example is the reef fishery in the Yaeyama Islands, southwestern Japan. The government promoted a community-based program to conserve the emporer fish (Lethrinus mahsena), an important source of local food.’) Although still evolving, this effort is a model for the conservation of co-managed, local fish populations. Near-term, we can expect continued over-exploitation of our fishery resources, with a call for more research on the effects of fishing activities on aquatic ecosystems. We can also expect to see policies for ownership of fishing rights, more active involvement of fishers in management decisions, and increased calls for protected areas and reserves. As for the future of our profession, it will be imperative that fisheries biologists continue to sharpen existing skills in computer-assisted, quantitative aspects of population dynamics. But they must also become multidiscipline-oriented experts who can collaborate in such areas as ecosystem-level modeling, restoration and recovery planning, socioeconomic assessments, the behavioral dimensions in managing fishers, GIS technologies, and ecosystem-level rebuilding strategies. The “new” fisheries science is the application of a battery of approaches to address a common set of ecological problems, goals and objectives. Those who continue to view our profession historically, as an inward looking discipline unto itself, become the true endangered species of the future! Longer-term, the focus will remain on science, not necessarily to control the harvest, but to avoid the problems of the past and maximize the efficiency of production. These and other speculative changes over the next 50 years were discussed by Rosenberg,20) who also mentioned the possibility of seeing fishing enterprises comprised of generalists rather than specialists, access controls for all marine fisheries, property rights that also include responsibilities for conservation, a diversified industry with little discard of unwanted catch, and little or no tolerance for those who violate rules. Many feel that such changes are critical to the future well-being of our shared resources. Fisheries professionals must promote a common vision for global conservation by interacting with and educating both users and decision-makers on the need for partnership approaches to protect fisheries from over-exploitation. Local communities are, after all, the ultimate resource caretakers. Co-management of resources minimizes conflicts and preserves traditional conservation ethics. We must not forget the human dimension in our conservation and management efforts. On a smaller, but not less important scale, we must look towards new international partnerships (such as those underway between North American and European scientists to coordinate fish health protocols that reduce the spread of pathogens). We must also promote approaches that reduce introductions and escapes of unintended organisms into new environments. It is time for world fishery societies to begin to discuss the need for bold research on integrated, ecosystem-level approaches for conserving exploited fisheries, and to orchestrate opportunities to bring scientists, fishers and policy-makers to the same table. This is a role the American Fisheries Society (AFS) has played quite well. Respective fishery societies should also examine their strengths for roles they can play in global conservation efforts, and in research to better understand trophic system linkages, test assumptions for innovative culture protocols, and develop alternatives to marine-based sources of protein for animal feeds. Regarding fisheries as sources of food for humans, we must give serious thought to how we will feed a growing human population, expected to surpass 7 billion people in this decade alone, and perhaps double by the middle of this century!! I do not naively suggest that multi-species, ecosystem-based management strategies are possible to meet immediate needs in reversing trends of over-exploited, global fish populations. Such approaches are extremely difficult, the data requirements are overwhelmingly complex, and the interactions and linkages poorly understood.3) Nor do I propose that any single entity can solve the management predicaments we face in contemporary fisheries science. Like many others, however, I do suggest a broader approach to management than used in the past one that considers the impacts of fisheries and management beyond a single-species approach that also involves the users and fishers. And I suggest the need for much more focused research on the ways in which fishing impacts ecosystem processes. The World Council of Fisheries Societies (WCFS) was recently revived following the 3rd World Fisheries Congress in Beijing China. AFS played a key role in orchestrating that revival, which now comprises several international partners. WCFS can be our global voice in unifying science-based visions and promoting new paradigms and policies for the betterment of both our resources and professionals in the 21st century. Together, we already provide a global source of credible science. We must ensure its continued use in addressing the world’s critical fisheries issues and in conserving precious global resources, whose future fates are in our hands. 1. Food and Agriculture Organization (FAO) of the United Nations. The state of world fisheries and agriculture 2000. FAO, Rome. 2000. 2. Garcia SM, Newton C. Current situation, trends, and prospects in world capture fisheries. In: Pikitch E, Huppert D,Sissenwine M (eds). Global Trends in Fisheries Management. Amer. Fish. Soc. Symp. 20. American Fisheries Society, Bethesda, MD. 1997; 3-27. 3. Jennings S, Kaiser MJ,Reynolds JD. Marine Fisheries Ecology. Blackwell Science Ltd, Oxford. 2001. 4. Food and Agriculture Organization (FAO) of the United Nations. 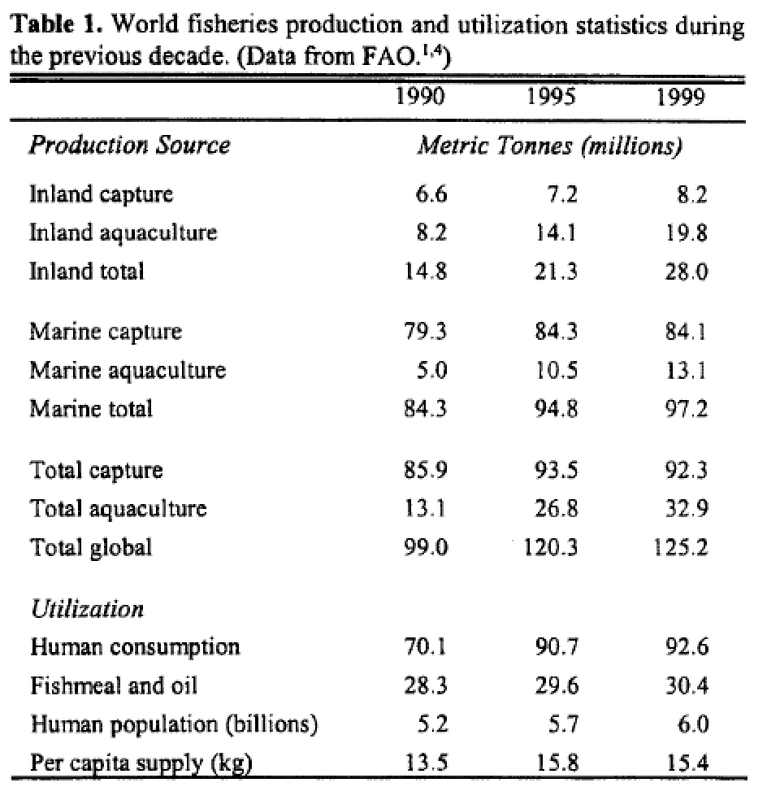 The state of world fisheries and agriculture 1998. FAO, Rome. 1999. 5.Smith T. Scaling Fisheries. Cambridge University Press, Cambridge. 1994. 6. Hillbom R, Walters C. Quantitative Fisheries Stock Assessment: Choice, Dynamics and Uncertainty. Chapman and Hall, New York. 1992. 7. Hutchings JA, Myers RA. What can be learned from the collapse of a renewable resource? Atlantic cod, Gadus morhua, of Newfoundland and Labrador. Can. J. Fish. Aquat. Sci. 1994; 51: 2126-2146. 8. Radovitch J. Lessons from coastal upwelling fisheries. In: Glantz MR, Thompson JD (eds). Resource Management and Environmental Uncertainty. Wiley & Sons, New York. 1981; 107-136. 9. Sissenwine MP,Rosenberg AA. Marine fisheries at a critical juncture. Fisheries 1993; 18 (10): 6-14. 10. Food and Agriculture Organization (FAO) of the United Nations. Review of the state of world fishery resources: marine fisheries. FAO Fisheries Circular 920, Rome; 1997. 11. Bruton M. Have fishes had their chips? The dilemma of threatened fishes. Env. Bio. Fishes 1995; 43: 1-27. 12. Pauly D,Christensen V, Dalsgaard J, Froese R, Torres F. Fishing down marine food webs. Science 1998; 279: 860-863. 13. Jackson JBC, and 18 coauthors. Historical overfishing and the recent collapse of coastal ecosystems. Science 2001; 293: 629-638. 14. Pauly D, Christensen V, Walters C. Ecopath, Ecosim and Ecospace as tools for evaluating ecosystem impact of fisheries. ICES J. Mar. Sci. 2000; 57: 697-706. 15.Sadovy Y. The threat of fishing to highly fecund fishes. JFish, Bio. In press. 16. Musick JA and 17 coauthors. Marine, estuarine, and diadromous fish stocks at risk of extinction in Nort America (exclusive of Pacific salmonids). Fisheries 2000; 25 (11): 6-30. 17. Naylor RL, and nine coauthors. Effect of aquaculture on world fish supplies. Nature 2000; 405: 1017-1024. 18. Pitcher TJ. Rebuilding ecosystems as a new tool for fisheries management: reconstructing the past to salvage the future. Ecol. Applications 2001; 11 (2): 601-617. 19. Hart JB. How can we create new management paradigms to resolve conflicts of interest in fisheries? Proc. 3rd World Fish. Cong. In Press. American Fisheries Society, Bethesda, MD. 20. Rosenberg AA. Controlling marine fisheries 50 years from now. J. Northw. Ad. Fish. Sci. 1998; 23: 95-103. 21. National Research Council. Sustaining Marine Fisheries. National Academy Press, Wash. D.C. 1999.22. Porter G. Fisheries Subsidies, Overfishing and Trade. Environment and Trade Publication 16. United Nations Environment Programme, Geneva. 1998.